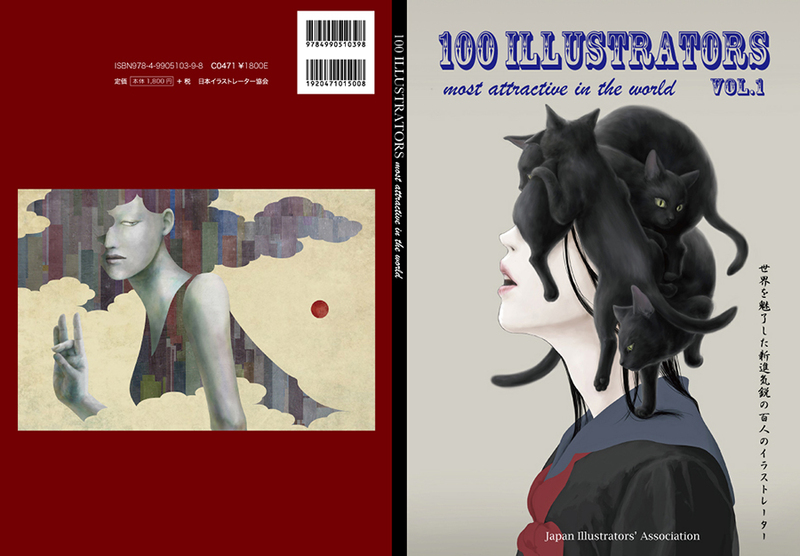 We publish the annual book every year, and post the winners' works of "JIA Illustration Award" and "Illustrator of the Year". In addition to the winners, we will make public offerings. Publication of general candidates is only one page. Not only the members of JIA, but also nonmembers can apply. This book will be published and sold at Amazon and other book stores in Japan. We will select from the entries and post them. Application is free, but if you win the right to post, you have to pay the posting fee. You can take a look at the list of illustrators who will be posted to this book. Please read the following application guidelines carefully. Please take a look to check the layout below. The page layout will be done by the secretariat of JIA. Please send the image data laying out your works in the workspace to the secretariat. There is no limit to the number of pieces to be laid out, but you can apply only one file. You can post the following contents. Art works : Please layout your works freely in the placement space. Artist name : In English and your own language. Contact : address, phone number, e-mail address, URL of your web site. Content : The client name, media of your works, and so on. It must be a photo appears your face clearely. If you do not want to to publish the photo of your face, you can post your portrait instead of your photo. But it must be one that is similar to your face recognized by anybody. You will receive the free copies of the books the following number depending on your size. WE will also distribute to the clients of JIA. The winners corresponding to the following items can post free of charge. The works can be posted is not limited to the award-winning works. Award winners please send your image data of layout your works, the photo of your face, and text data which you want to post..
First of all applicant open the entry form and fill up the requiered information and send. And then send your file of the image layout your works to the person in charge. We select works to be posted from entries. Send the layout data of your works and the text data to the person in charge. Secretariat will lay out the pages. Do the calibration of the characters on the web for yourself. After finished the calibration, we will send the data for printing. We will not layout your images for you. Please make the correct data of layout for printing with your own responsibility. You can send only one JPEG file laying out your works at the time of entry. After you get the right to post your works, please send the items as follows. The text data of introduction of works and profile. The photo of your face. Mac can not open the .txt file made by Windows, so please send the Word file or write it in your email directly to the person in charge. General entry period : From September 1st to Desember 30th. Recruitment will be closed when the number of illustrators posted in the book reaches 100. You can pay the entry fee via PayPal. We recommend to pay via PayPal, because the fee of bank is expensive. The name of the person in charge is "Takahiro Kanie" and the mail address is . In case you pay via PayPal, the entry fee is as follows. Applicants can not cancel after they get the right to post their works. Do not apply if you can not pay the posting fee. You are responsible for creating your own layout data of your works for the book. Please check the following way how to make the layout data. 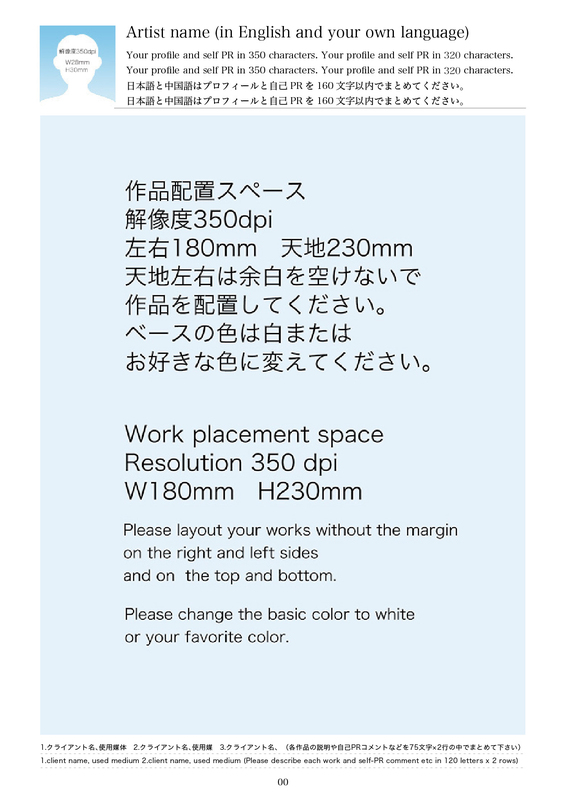 First you make a new file of the layout space (color mode:CMYK / size:W180mm H230mm / resolution:350dpi). And then open the images which you want to post. Select your image and copy and past on the new file. You can layout your images freely. You do not need to put any margin on the top and bottom left and right of the space. When you save the image, integrate the layers and select the JPEG file. You do not need to check "Enbed color profile". Image quality 10 "maximum (low compression rate)", and save it to the baseline (standard). First you make a new file with CMYK color mode and A4 size. 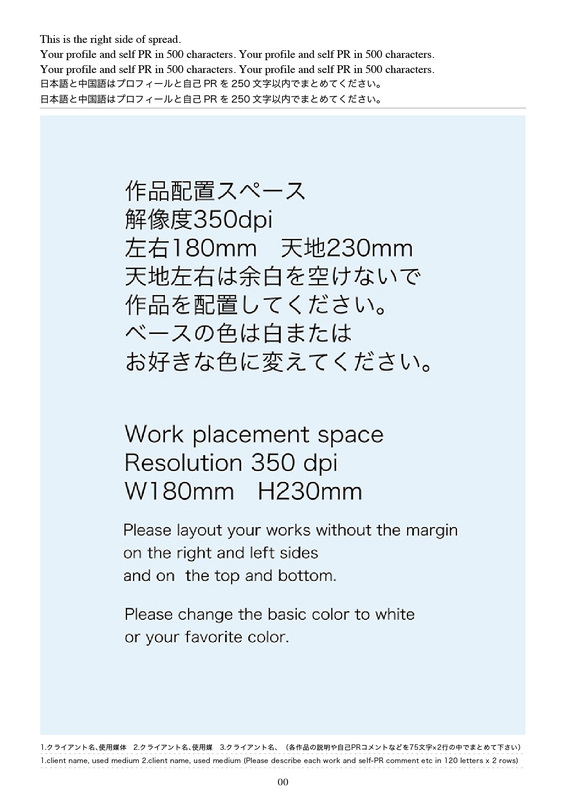 Then make a rectangle with the space W180mm×H230mm with no lines. And then you open your images created with Adobe Illustrator. Select your image and copy and past in the rectangle on the new file. Export the image to the JPEG file. Make sure that the image quality 10 "maximum (low compression rate)", the color mode CMYK, the baseline (standard) resolution to 350dpi, and check the "anti-aliasing" and "embed the ICC profile". You can download a template (Illustrator CS5) from here. You can put numbers(4mm×4mm) on your images to introduce them. If you want to put numbers, please download them. Click this link to download the numbers. Put the numbers to be aligned the upper left corner of your images. Finally make your file simple with no layers. Make sure the names of your files should be with alphanumeric characters, letters should be all lowercase. It should be "the posting size_first name_family name". "_" should be underbar not hyphen. And compress it to Zip file. If it is over 10MB, please send it via web site for download. Please be carefull about the copyright and portrait rights of the image to be posted. Even if any trouble about the posted work occurs, JIA will not take responsibility. As for posted works, please take responsibility at your own risk. Fill up the application form to make a entry, and then send the layout data. If you have any question, please ask the person in charge.